As you all guys knows that we at WindowsPCSecrets share some amazing Apps for PC and this is why today we have come up with something interesting. So, are you looking for Best GBA Emulators or some people also known them as best Gameboy Advance Emulators that will allow users to play their all-time favourite GBA Games right on their Windows PC. Well, all the classic gamers know that GBA was one of the most tremendous successes from Nintendo, that allow gamers to run their favourite games anywhere they want and without any limitations. In case, you are wondering, GBA (Game Boy Advance) was an upgraded version of Game Boy Colour and it was able to play games that are in the advanced games category. The handheld also had amazing colour qualities and more powerful hardware. Although, Now GBA isn’t available and people still want to play the Top GBA Games. Those who don’t possess the handheld console, it is one of the best way to emulate them on your Windows PC and there are plenty of amazing emulators available to download for Windows operating system. Well, you should know that these GBA Emulators are specifically developed and designed to allow users to play GBA games on PC (Windows OS based) with ease, and it will also provide you some more useful features that are otherwise missing from your current handheld console. 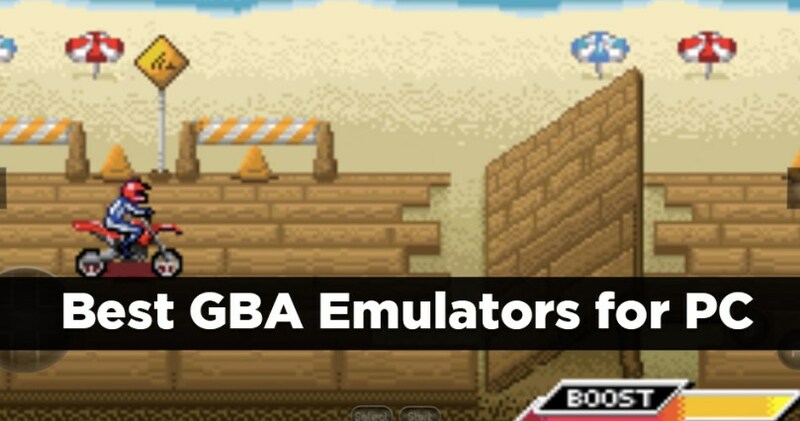 The first GBA emulator on our list is known as mGBA and when you decide to run GBA ROMs on PC, you will get some more features with it. The additional features come with the ability to save the game whenever you prefer and some patches for games which you cannot run as well, and cheat code support as well. Some of them highlighted features of mGBA are listed below. It has ability to override the game and enable ROM patches. It supports huge catalogue of GBA games. VisualBoy Advance is one of the oldest and trustable Game Boy Advance Emulator that you have to try once. It is the one emulator which we used to when we are not familiar with GBA. At that time, there used to be slow emulator because of hardware, but almost everything is now changed and optimized for the different hardware. VisualBoy Advance comes with advance features now that users will never get in a standard handheld console. It changes the complete gaming experience on this emulator and let users enjoy the game. It allows users to save the game for later playing. It supports controllers and button remapping. Take screenshots or record the gameplay. You can use cheat codes to make the experience more fun. Higan GBA Emulator is another best emulator that allow users to run GBA Games on PC and this emulator is simple and easy to use, at the same time it allows you to run on almost all the hardware you want on it. The Higan GBA Emulator allows users to control the emulator however they want. This emulator not just support for GBA Games, but Higan GBA Emulator also supports emulation for Famicon, Super Famicom, and Gameboy Colour, Sega Master System, Mega Drive and even Game Gear. It supports wide collection of ROMs to emulate. It offers enhanced colour reproduction. No Cash GBA or No$GBA Emulator is quite popular emulator for GBA that found lot of relevance and fame due to the unconventional name. Apart from it can run GBA games, the emulator can also run Nintendo DS Games. While the DS part is not a proper development and perfection, there are several games that work perfectly. It let the user configure the game any way they want. If you are looking for the Best GBA Emulators that it is simpler but at the same time can perform better than others. The BatGBA is perhaps one of the easiest GBA emulator in this list. So you don’t need to have advanced options to use it. This emulator takes quite small amount of space and runs almost any hardware with great ease. The emulator allows the users to play all commercial and non-commercial GBA games with ease. There is no nonsense installation. The emulator is perfect for users who want simplicity. It does not need lot of knowledge. So we have shared Best GBA Emulators that are free to download, and all of them let you play GBA games on PC without any issue whatsoever. There are few in the list not as good, but while making this list, we make sure that we test them personally and then added in the list. The emulators are in this list have gone through one by one testing by our team members and we make sure they all can run games without crashing on basic smart devices. While it was impossible for me to test the entire GBA catalogue. If you like this post, then please share this post with your friends and family who still want to play classic GBA games. If you have any doubt or query, please drop them in the comment section below.